Welcome to Day #20 of the Restoration Project. This post is a little longer than usual, but I am being brave and sharing a section from my memoir-in-progress. As you can imagine, the book’s theme is about being tightly wound. This section illustrates a key concept that I relearned this weekend, thanks to the lovely, smart and gracious Annie Downs and the one-of-a-kind, all powerful and wise Holy Spirit. I always wanted a daughter and was ecstatic not to be pregnant anymore, after my firstborn was delivered; no more back pain, no more protruding abdomen, no more wondering what labor would be like, or contemplating what gender we would have. Adam cried with awe and joy, while I was thankful to be through labor…a big fat check-mark off my lengthy lifelong to-do list. It felt like I had climbed Mt. Everest and I was basking in the accomplishment of what the Lord and I had done in that delivery room. I was high on adrenaline and felt like Superwoman. Then it dawned on me, like a blinding light that hurts your eyes as it blazes through the windows, the work was not over, it was just beginning. What?! But I had just climbed Mount Everest how could any more be expected, especially when I had just laid it all out on the table? Now I had to nurse this precious one and forego the sleep that was desperately needed? It seemed unfair, unreal, and unbelievable. Can we freeze time for a Zack Morris minute and regroup? Can I just take a nap? I had at least earned that, right? Side note: The birthing class instructors should warn you that you will still look pregnant after delivering a baby. We had a sweet four year old from church come to visit in the hospital and she asked if the baby was still in there—in my tummy. Drop-kicking thoughts raced through my mind, and I wondered if jeans would ever be an option again. I had the deflated saggy gut and the beautiful prize to prove it: I was now a mother. I had crossed the finish line and produced satisfying results. However, this was not a sprint, or even a 10K, it was marathon—more like an ultra-marathon. An exhilarating and exhausting journey lay before me, requiring more than seemed possible. Years later, as I was reading C.S. Lewis’ classic, The Horse and His Boy, I stumbled upon a beautiful illustration of motherhood. A little context first…Aravis and Shasta are two runaways, on their way to warn King Lune of an impending attack. On their journey they are hounded by a lion and barely escape his clutches. Aravis is wounded and remains at the sanctuary of a kind hermit while she recovers. Before Shasta can catch his breath, the hermit tells him that he must waste no time in finding the King and warning him of the coming attack. Not long after my daughter was born, as I laid in the delivery bed exhausted, relieved, and full of joy, I heard the words, “I think she’s ready to nurse” singing from one of the pediatric nurses. It struck me then, like a dissonant chord, that although the physical labor of childbirth was done, the labor of mothering was just beginning. Lisa-Jo Baker describes this reality in Surprised by Motherhood, “A mother continues to labor long after the baby is born” (pg. 8). I was overwhelmed with the magnitude of this news. Keep laboring? But I just did that. Like Shasta, I wish I would have called out in that moment, “Where is the King?” Maybe not audibly, but in my soul, the place of greatest need. Because King Jesus was the only one who could prepare and sustain me for the task at hand, not just the nursing but the raising of this little life. I thought I knew so much, but there was so much, still is so much, to learn. I thought I arrived with the delivery of this life, but the King used her arrival to deliver me. Annie referenced Jefferson Bethke’s new book, It’s Not What You Think and how he pointed out that Adam and Eve were created on the 6th day, so their first full day on earth was the seventh, when God rested. Could it be they rested so that they were ready for what was to come? 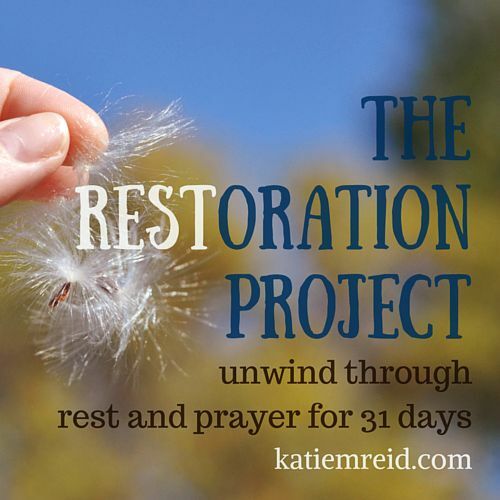 All this time, I thought that this month of the Restoration Project was to recover from a busy season, and while that may be partially its purpose, what if it’s more about preparing us for what’s to come—what’s next? This thought is both exciting and a little exhausting. It reminded me of how I felt all those years ago in the delivery room. I had just given birth, which felt like such a big thing, but the really big thing—of raising a life—was just beginning. One challenging, yet wonderful event was followed but an even more challenging and wonderful season. Maybe all this unwinding through rest and prayer is more about being prepared and equipped for what’s coming? Are you ready to welcome in the new thing, the next thing? P.S. Get caught up on Days 1-19 of the Restoration Project. Linking this post with the #RaRaLinkup and #TellHisStory. P.P.S. It was a delight to meet Annie and her assistant, Eliza, this weekend. Annie spoke about being brave, at the retreat. You can purchase her book, Let’s All Be Brave, through my DaySpring affiliate link (click on the Daysping image on the sidebar of this blog to get to their site. Then click on the ‘Gift Shop’ tab and then ‘Christian Living Books’ to find Annie’s book). Right now you can get free shipping (until tonight at 11:59pm)! Click on ‘Standard Shipping’ at checkout. You can also download two chapters of Let’s All Be Brave for free (while you wait for the book to arrive on your doorstep) through this Noise Trade link. Katie, I’m blown away. I too have been in a season of rest. I even posted about it yesterday…. Faith to Rest. As I’m trying to wrap my mind around it & obey I have felt this voice everywhere saying what you just wrote. ..yes, rest, but there is more to come. This is preparation. Sigh. Exciting. Humbling. Scary. Thank you for sharing. I look forward to your book! Thank you Julie. Isn’t that crazy how God speaks to us from many angles and levels? Thanks for commenting. I’m heading over to read your post. Thank you Dolly. The observation was not original with me, but I am thankful I heard it, because I think it is true. It changes your perspective when you imagine that you are getting ready for the next thing. I’ve never thought of it this way before, Katie. But I think you’re right–rest is not a reward for a job well-done, it’s God’s gift of time to prepare us for the next thing (which will probably be harder than we imagined). If we spend those quiet, in-between times growing closer to Him, we’ll be prepared. Oh Katie, with you here. “Mind blown!” I’ve considered this before, yet there’s something about hearing it depicted with Adam & Eve that sinks the idea in deeper. 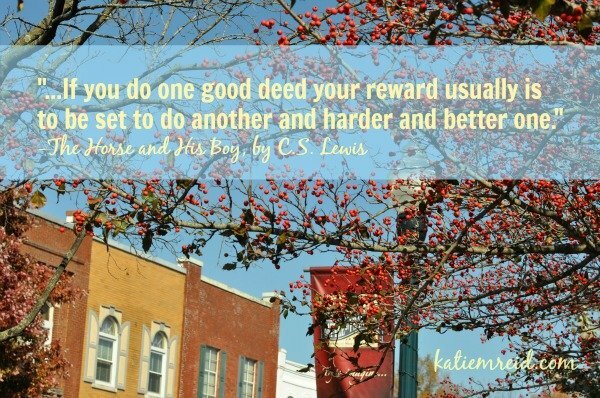 Cheering you on in your times of rest and times of whatever-God-has-in-store. Hi Friend! Thanks for commenting and for your encouragement. What a lovely, well-crafted except amd post. Thank you for sharing. Thank you for the encouragement friend!